"You grow up quickly at 23 under conditions like these." This article marks the third story from Bill’s Korea Files. Click here to read part 1, and click here to read part 2. Normal Briefing: Fighter sweep along the Yalu. Weather clear en route and at the target. Our Group was instructed to do an aerial sweep along the Yalu River in North Korea, checking for enemy MiG‘s that had been active in the area. A Group would be made up of four Flights: Red, White, Blue and Green. My Flight, Green, consisted of myself, Green 1; Lt. Mike DeArmond (now retired Brigadier General), Green 2; Don Griffith (now retired Active Ohio National Guard), Green 3; and Charlie Spath, Green 4. After takeoff, the four Flights joined and proceeded North in a 16-ship formation. After two sweeps, MiG’s were spotted coming South across the Yalu River. The group broke into Flights, and the then Flights moved into Combat Spread Formation. We were around 30,000 feet when I saw eight MiG’s going in a westerly flight path at 3 o’clock low. Unusual, as they normally came in above us. Don and Charlie were off my right and in better position to initiate an attack, so I told Don to go in and we would cover. Just outside firing range as he moved into position, Don’s engine flamed out. He broke down and away, with Charlie, heading East. To cover his escape, I took Mike and pressed the attack, tying up the eight MiG’s. I targeted their outside man and was scoring heavily with my .50 calibers judging by the APT’s (All Purpose Incendiaries) that flash when they hit. When Charlie called that he had been hit, obviously by another group of MiG’s as we had been separated several minutes, I broke off my attack and did a 180, turning west to assist Charlie. I spotted a black smoke trail off in the distance and told Charlie we were on our way. He said he was heading for the Iron Triangle, an area inland from Wŏnsan Harbor with friendly guerillas (Wŏnsan is a port city and naval base located in North Korea along the eastern side of the Korean Peninsula, on the Sea of Japan). Throttling way back on the RPM to save fuel, I contacted the Navy Task Force (who operated off Wŏnsan Harbor) on the emergency channel with a mayday. They asked if I had the downed pilot in sight on the ground, and I said, “No,” but told them where I thought he may be. They said normal Search and Recovery would not be launched without a visible sighting, but they had 11 Vought F4U Corsairs in the air within five minutes of his location and would take a look. I was now dangerously low on fuel, so I thanked them and headed south back to base, gliding most of the way. As a Flight Leader, losing a member is very difficult. Charlie had recently married his fiancé, who was the daughter of an Air Force Colonel in Japan. I was an usher at their wedding. As soon as I could, I went to Japan to tell her and her parents what had happened. She was two months pregnant with Charlie’s child. That was the last I’ve ever heard of them. You grow up quickly at 23 fighting in a war. 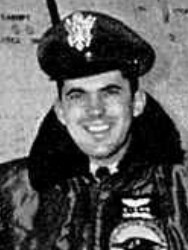 Lt. Charles Ray Spath was posthumously awarded the Distinguished Service Cross for the partial destruction of an enemy aircraft before ejecting from his destroyed F-86. He was reported to have survived as a North Korean POW for months after his capture but was killed in captivity after a failed rescue mission. His remains were never recovered.